Thomas Molloy checks into a heritage property in a landscape shaped by the Ice Age... right here in Ireland. 'Guys, I caught two frogs," said the youngest, with eyes wide open and an amphibian squeezed a tad too tightly in each hand. It was the first of many small discoveries on our first morning in a remote part of verdant east Cavan, where multi-coloured dragonflies buzz all day long. We had arrived the night before, after driving for miles along the sort of roads that can just about fit a car and have grass growing down the centre. The reward was a warm welcome from Olivia, who looks after the house for the Irish Landmark Trust, and then, the pleasure of waking up in one of the most charming houses we'd ever slept in. The house was Knocknalosset, a two-storey farmhouse dating back to the 17th Century with low ceilings, lots of wooden panels, a walled garden and buckets of charm. The house was the perfect base for a family and a West Highland Terrier to explore this part of Cavan, where the bigger towns include Shercock, Canningstown and Bailieborough. East Cavan is famously drumlin country, and these ice-age remnants are visible everywhere; giving the countryside the appearance of a giant sheet of green corrugated steel that stretches for miles in all directions. 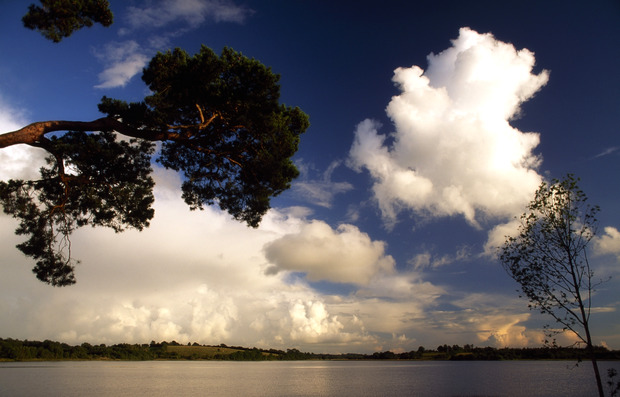 The drumlins are dotted with rivers that feed the hundreds of lakes, including Lough Oughter, Lough Gowna and Lough Ramor. The ice age has shaped Cavan's landscape, while the plantations of the 17th Century have shaped the towns and villages which can often boast churches and prayer houses of half a dozen different denominations. On the weekend that the marriage equality referendum was passed, we skipped the fire and brimstone and went canoeing in Lough Oughter instead. Canoeing was easy to organise; we drove to the Cavan Canoe Centre, near Butlersbridge, where the very helpful Mark helped us to hire two ordinary canoes and a difficult-to-paddle Canadian canoe for €80 which also included the cost of wet suits and life jackets. It's hard to overstate the childish sense of adventure when heading out into a lough in a small family flotilla and how much fun it was in an Enid Blyton or Swallows and Amazons sort of way. Lough Oughter, which connects to the Blackwater and the Boyne, should probably be much better known than it is. It contains, on a small island, a fearsome and picturesque fortress called Clogh Oughter Castle that was partially destroyed by Cromwell and was also the place where Owen Rua O'Neill met his death. There is something exhilarating about paddling though an 18,000-acre lake looking for a historic castle while spotting the relatively rare whooper swan and Great Crested Grebes which breed in the lake in great numbers. Not being particularly fit, and utterly inexperienced, I found the paddling hard going, but this was definitely the highlight of our Cavan trip, and we will be back to explore more of this lake. Perhaps one day, we will even paddle on to the Blackwater and Boyne and out to the Irish Sea - now that really would be an adventure! Later, we popped into the surprisingly good county museum (€8 for a family ticket) in nearby Ballyjamesduff before seeking out Clogh Oughter Castle. The museum contains a large display devoted to the varied history of Clogh Oughter Castle. In an ideal world, we would have visited the museum before the canoe trip to know what we were looking at. The museum also contains interesting oral histories from locals, lots of artefacts and uniforms, as well as an intriguing recreation of the trenches of World War I. While still not clear why the museum has such an elaborate network of outdoor trenches, it nevertheless made for a compelling visit and there was something wonderful about being able to run through the outdoor exhibit with nobody else around. Hungry and tired, as one often is when enjoying the outdoors, we headed for the highly recommended St Kyran's restaurant in Virginia. While nothing much from the outside, it had been praised by friendly Olivia from the Landmark Trust and she was spot-on. Away from the road, St Kyran's has huge picture windows which face onto beautiful Lough Ramor and endless crannogs. It was not hard to see why the place is fast becoming a popular venue for weddings. For us, it supplied a really fine meal at a reasonable price along with that rarest of finds; a decent children's menu that goes beyond chicken nuggets. Feeling a little scruffy after our canoeing, we should have definitely booked and perhaps dressed up a bit; the place was hopping with couples and groups of friends, and we could only secure a table by promising to leave by 8pm but the rushed meal was worth it and St Kyran's was a great find for a family that has often been disappointed in the past with meals away from home. The early finish to our meal and a lengthy drive at twilight though Cavan's back roads along with one or two detours (thanks to an over reliance on the sat nav) meant that we back "home" in Knocknalosset by 9pm. There are few things as pleasant as relaxing in front of a wood-burning stove in an old house after a day in the fresh air. The charm of Knocknalosset is that you can do just that and then switch off completely because there is no television, no phone, no 3G and no wifi. As we played the first family game of Scrabble since last summer it felt good to be a long way from the bright lights of the city. Sunday saw us eat a leisurely breakfast in the kitchen and then reluctantly pack and begin the journey home. Not wanting to leave Cavan too early, we stopped off at the 565-acre Dun na Ri forest park just outside Kingscourt (€5 for entry to the Coillte carpark) to stretch our legs and give the dog a final sniff of one of Ireland's least known and least explored counties. Situated along the banks of the River Cabra with a dramatic gorge, Dun na Ri is one of those absurdly romantic gardens created by 19th-Century aristocrats to commune with nature, and a reputed campsite for no less a personage than Cuchulain himself. As the sun shone down on magnificent beech and chestnut trees and quixotic creatures carved out of wood popped up here and there, it was impossible not to love Cavan and look forward to a return visit. Thomas Molloy and his family enjoyed a stay in an Irish Landmark Trust house dating back to the 17th Century in a remote part of east Cavan where the green countryside is still unspoilt and the 365 lakes offer unlimited opportunities for canoeing and bird-watching. Knocknalosset House opened this year and the trust is giving a 30pc discount all this year as an introductory offer. Rates for a week from €735 (including discount), June-September. Sleeps four, dogs allowed, child-friendly. To avail of the special offer contact Irene on (01) 6704733 or email bookings@irishlandmark.com, quoting the special offer. The Molloys also visited the Cavan Canoe Centre in Butlers Bridge (086) 266 0686, and ate at St Kyran's on the Dublin Road, Virginia. (Open Wednesday to Sunday. Ph (049) 854 7087.